Finally, The Berlin File successfully premiered as one of the most anticipated Korean films in 2013. The film starring HA Jung-woo, HAN Suk-kyu, RYOO Seung-bum and Gianna JUN is raising the expectations of movie fans. Korean Cinema Today had an interview with director RYOO Seung-wan who has inserted another masterpiece into his filmography since the release of The Unjust (2010). - It is said that you obtaine inspiration for The Berlin File from the Berlin International Film Festival. After completing The Unjust, I wanted to break the rules of my film production. I wanted to make a film of a different genre which I never dealt with. A spy thriller came into my head. It was an action thriller with conspiracies set in a third country.I love spy thrillers. Fortunately, I had a chance to visit the Berlin International Film Festival. I received inspiration for The Berlin File while traveling around the city of Berlin for several days. - Would you tell me about the inspiration in detail? During the travel, I had various thoughts. I was most inspired by the fact that Berlin was a city that symbolized the division in the 20th century. While looking at the maze-like space of the Holocaust Memorial, I thought about the sequence of a mirror room in The Lady from Shanghai (1947), an Orson WELLES film. I thought that I could make a film about people chasing one another. The North Korean Embassy in Berlin stimulated my imagination, too. Berlin has the largest North Korean embassy in the world. I thought that I could direct a realistic movie where South and North Korean agents engage in a dog fight. - The Berlin in the film looks very dismal and dreary. How would you express the city in the film? The film was actually shot in Berlin of Germany and Raga of Latvia. Both Berlin and Riga have many feels of Eastern Europe so I could shoot scenes of Berlin that can satisfy audiences. - This is your first overseas location, right? All of the staff members experienced many difficulties. I had trouble communicating with local actors and actresses as I was poor at speaking English. Movie fans had high expectations about this film as The Berlin File is a big-budget film and stars Korea’s leading actors and actresses. I carried a lot of weight on my shoulders as I thought that I had to make a cool movie set in Berlin. - Secret agents are a job. This job is dramatic as they have to endlessly believe that they are right. How are the charactersin The Berlin File? I desired to make characters more human. 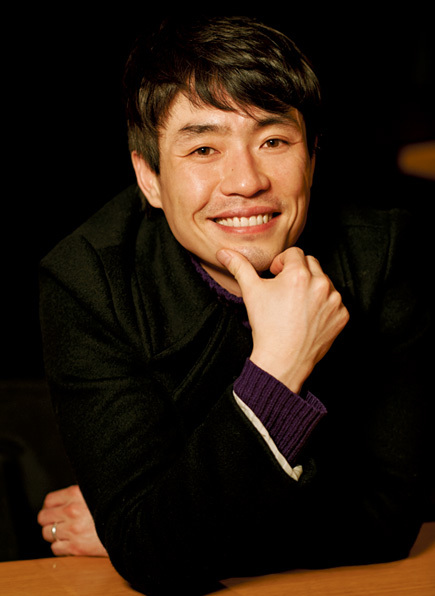 After watching the movie, actor LEE Gyeung-young explained that The Berlin File is a story about deserted people. That is right. “The story can happen any time in the system called the power of a nation,” PARK Chan-wook also said. I wanted to tell a story about ordinary people who have extraordinary jobs. It is right to say that The Berlin File is a film about people who have jobs as spies rather than a spy movie. In fact, the USD 4 billion account of North Korea is a macguffin. A more important thing is relationships among individuals who become related to each other even though they know that they are enemies. - HA Jung-woo, HAN Suk-kyu, RYOO Seung-bum and Gianna JUN mix well in this film. It is great casting. When you cast them, did you face any problems ? I was lucky. This casting is perfect. Actor HAN Suk-kyu was the first one to call me that he would take part in the project. “We will join the project if we act with HAN,” HA Jung-woo and RYOO Seung-bum told me. Gianna JUN, the heroine of The Thieves, jumped on board as she wanted something new. Lady Luck really smiled on me. - Now, let’s talk about action scenes. You have a gift for action films. Did you intend to show new actions in this film? Action scenes should contain the content of a film. They have to make audiences think, “I wish ‘A’ defeated ‘B.’ If the theme of scenes are an escape, a chase or a confrontation, I wanted to show the stories of the scenes through actions. The Man from Nowhere (2010), a LEE Jeong-beom film, made me think that way. The movie shows the ultimate goal of action films. The answers are salvation, sacrifice and revenge. The beginning of The Berlin File is “The Count of Monte-Cristo.” I wanted to show a devastating feeling which a falsely accused man has while making his enemies pay for what they did to him after making a comeback. - Your scenes are impressive. Was it difficult to shoot them? I think I could have done them better. If I am given a second chance, I will do better. I am quite sure about that. One popular reference came from Heat (1995), a Michael MANN film.Once I heard from an American producer that U.S. police SWAT teams utilize the shooting posture of Val Kilmer in Heat as a good example. So when a new member is a bad shooter, he or she is advised to learn from Val Kilmer in Heat. (Laughs) It is nearly impossible for directors of movies of this genre to create a scene that experts recognize. - The film ends as if to say that there will be a sequel. Do you want to direct The Berlin File 2? I became exhausted while shooting this film. So right now, I don’t have a plan to make its sequel. I really enjoy watching my films but it is very hard to watch The Berlin File. (Laughs) Although the end of the film seems to tell audiences that there will be a sequel, making the sequel will be possible only when they love The Berlin File. So production of its sequel depends entirely on audiences. - It will be wonderful to screen The Berlin File at the Berlin International Film Festival. What do you think? I also hoped so. But this time, I could not get a chance. I hope that my film will be screened at the Berlin International Film Festival someday.